COLLINGWOOD has wasted little time in getting Irish recruits Anton Tohill and Mark Keane settled into professional life in Australia, putting them through a light skills session on their first day at the club on Wednesday. 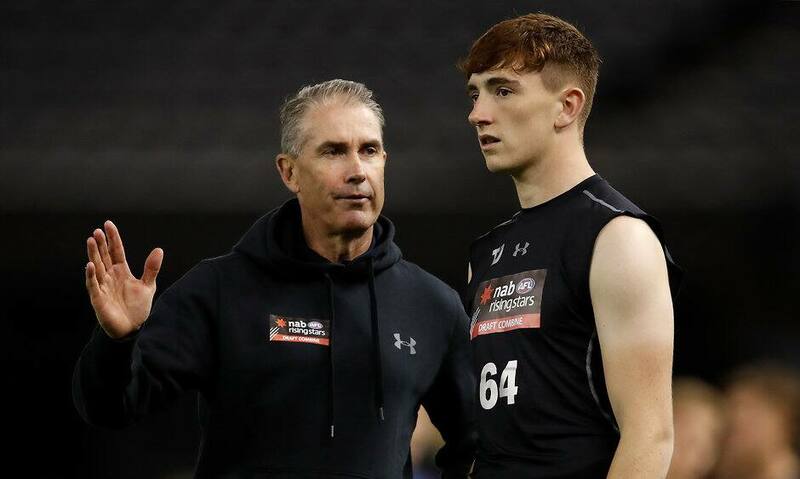 Tohill and Keane, who were signed by the Magpies as Category B rookies after returning strong results in the recent NAB AFL Draft Combine, arrived in the country at 7pm on Tuesday night and were in bright and early at Magpies headquarters the following morning. Although the first-to-fourth-year Collingwood players don't formally return until November 19, the key position pair are keen to get a jump start on their professional careers, according to the club's head of academy Tarkyn Lockyer. "Their kicking, their handball and marking looks pretty sound at the moment, although just getting used to our ball is a challenge for them," Lockyer told AFL.com.au. Keane stands at 194cm and Tohill is listed at 198cm, with both players displaying strong athletic attributes at the Combine. Lockyer said Keane had already shown he is well-suited to marking the high ball, while Tohill's competitiveness had been immediately apparent. "Today we sat a couple of balls on Mark's head and his ability to jump and take the ball at the highest point was pretty impressive," Lockyer said. Keane finished second in the goalkicking test at the Combine, which was won by Collingwood's Next Generation Academy prospect Isaac Quaynor. Tohill, the son of Gaelic champion Anthony, who spent time as a rookie at Melbourne in the 1990s, finished 12th in the overall kick testing. Lockyer said the next two weeks would be used to hone the players' skills and teach them the intricacies of the game before the rest of the players resume training. Lockyer and pathways coach Craig Black will work closely with both Irishmen to ensure they are quickly brought up to speed with what the game requires. "Once training starts it's going to be a really steep learning curve for them," Lockyer said. "We'll have to put extra time into these guys with their game development, understanding the vocabulary that we use and with their skill acquisition stuff as well." Lockyer said big American Mason Cox and former college basketballer Jack Madgen, who played four senior games in 2018, would provide examples for the Irish pair. "One of the beauties we've got in working with Mason over the last few years is that he's given us a great blueprint about what the program should look like," Lockyer said. "We've been quite successful with our Category B players in a short period of time but what both of those guys had was an unrelenting work ethic. "I've sort of explained that to the boys already – the coaches are there to guide them and to help them, and push them, but it's going to be them that really run the program. "They're over here for a reason and while they're here they may as well make the most of it."